This heap of sparkling "sea-gems" keep Sea-Monkeys happy and entertained by giving them toys that they will really play with! So pretty they might as well be REAL. Watch the Sea-Monkeys have fun by tossing Sea-Diamonds around like beachballs! They even "learn" to climb up and ride them as if they were surfboards. This gives them the exercise they need to stay fit. But MOST AMAZING, as the water levels drops in your aquarium, Sea-Diamonds RISE UP from the bottom and FLOAT MID-WATER, seemingly in DEFIANCE OF THE LAWS OF GRAVITY! 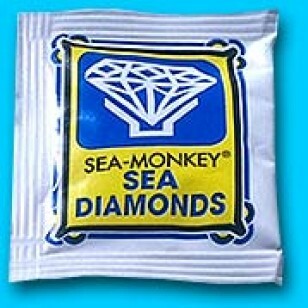 The Sea-Monkeys now wind their way among the mysteriously suspended gems swimming in and out of the enchanted "maze". So fantastic, it MUST be seen to be believed!